Today, I'm reviewing History Revealed: What in the World? Volume 1-3, by Diana Waring. I have seen Diana at homeschool conferences a couple of times, and her materials always intrigued me. I purchased a couple of tapes (does that date me?) of her True Tales and Digger Deeper materials, and we loved listening to those. A multi-CD set that takes you to the heart of history and God’s guiding hand. Meet the rulers and dreamers who changed the course of history. Investigate ideologies that influenced change and tragedy. Oh, my. We have been having so much fun with this! The kids and I are working through Ancient History (Volume 1). I listened to part of Romans, Reformers, Revolutionaries (Volume 2) and will be using this volume with the kids this school year as we study Medieval history. I have listened all the way through World Empires, World Missions, World Wars (Volume 3). I have to confess something though. My teens were pretty skeptical. I put in the first CD, and they paused it. "Is she always this, this EXUBERANT?" they wanted to know. Eye rolling a-plenty. I told them that a) they really needed to give her a chance, and b) this is a review so they are stuck. Not exactly how I would prefer things to go, you know? Before the end of the first CD, however, specifically once we got to more of an archaeological focus, they were grudgingly admitting that this was interesting. I have to say that part of this attitude is just that they simply do not have any desire to be taught, yet again, about Creation and the Flood. Had I started with a different volume, I think they would have warmed up faster. By the time we were to the end, they'd beg for more. We sat down yesterday to listen to the track on Julius Caesar. They wouldn't let me stop... and we continued all the way to the end of the last disk. So what did we think? We are loving this. But. Connor (18) complained a bit about how she leaves some important stuff out while giving lots of details that don't really matter. We talked about that a little, and I made the point that this is 6,000 years of history, being told in about TWELVE hours. Hello? Of course she can only touch on stuff and there are going to be important details that are missing. Diana is choosing details that strike her, or that she thinks will make things memorable for her students. Her choices are going to differ from yours, and from mine. Connor agreed that she does make the material memorable. William (16) said, "It's history. Of course I like it. I just want to get to Medieval times. I'll like that even more." Overall, we are loving this. Diana makes connections that I simply haven't made myself, and she tells the stories in a way that helps you to really remember the big picture. 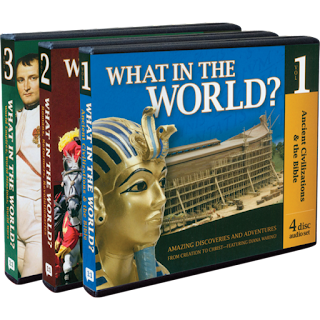 Master Books includes these three volumes as part of their 5th Grade Homeschool Curriculum Set. This curriculum set includes other subjects as well, but one great product is Big Book of History which I reviewed a while back. I think that is a perfect book to go along with these CDs for elementary ages. For my family, we are using the CDs as a fun 'big picture' approach to our history, and/or just as an audiobook to listen to when we are driving. I can already see how listening to this multiple times will really work to put these events in context. Disclaimer: I received this set for free from Master Books. No other compensation was received. The fact that I received complimentary products does not guarantee a favorable review. But HOW will you teach Chemistry? Back to Homeschool Blog Hop Begins Tomorrow!